One of the many display cases that lined the walls of the Yihe banquet hall in which presentations were made. All the attendees seemed interested in most of the program and each speaker had to be pleased by being given a full audience. All the presentations were informative and some were filled with exciting slides, many by famous American photographers such as Harold and Erica Van Pelt and Jeff Scovil. One could hear the audience respond to the beauty of these photos of various minerals. Between the talks there was time to meet attendees and new friendships were made. Displays were extensive and some exciting fossils (Dr. Burkhard Pohl brought an absolute superb pterodactyl fossil from Germany for exhibition) and mineral specimens were seen for the first time in China. There were also display cases of Chinese minerals for selling for those interested. 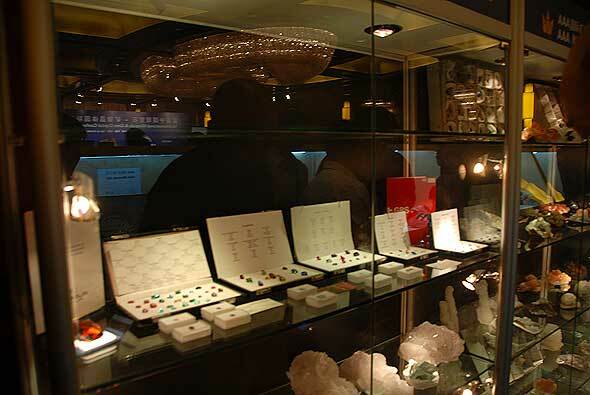 And a satellite show with about 20 Chinese mineral dealers was held at the hotel next door concurrent with the conference for buyers to view and purchase various mineral specimens. The evening banquet celebrating the success of this show was an event to remember both for food and entertainment including many live performances from Mongolia. This being the very first conference, there were of course many things that can be improved upon next year—and will be, according to the competent staff who listened to various suggestions—but the necessary foundations are in place. 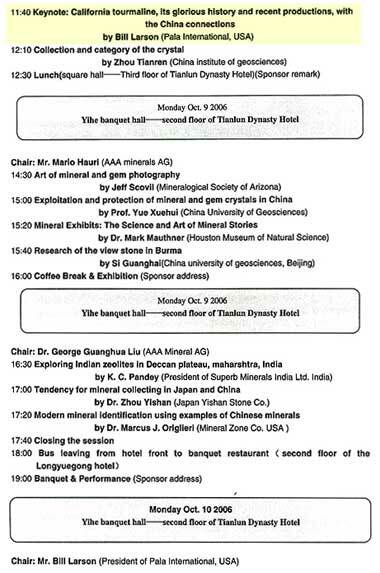 I look forward to 2007’s second gem and mineral conference. 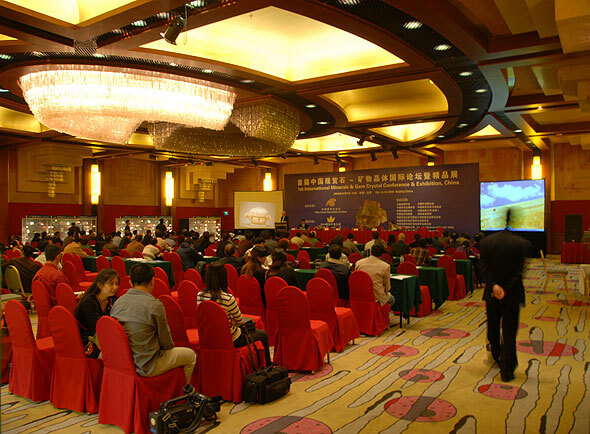 Attendees take in a presentation beneath the chandelier of the elegant Yihe banquet hall of the Tianlun Dynasty Hotel. The Larsons were accompanied by other presenters including Edward Boehm, President of JOEB Enterprises, and Dr. Marcus J. Origlieri of Mineral Zone. Below we feature abstracts of the Larsons’ presentations as well as photographs from the conference and their travels. Throughout history connoisseurs of colored gemstones, mineral collectors, even royalty have treasured tourmalines for their multitude of colors, beautiful crystal formations, durability, and rarity. 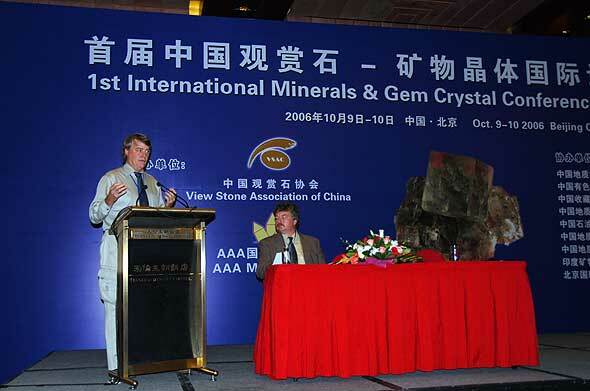 On Day 1 of the conference, Bill Larson delivers his presentation on the China–California tourmaline connection as moderator Dr. Burkhard Pohl, Director of the Wyoming Dinosaur Center, looks on. Tourmaline is a complex borosilicate of aluminum, containing variable amounts of alkali metals, calcium, iron, and manganese. Tourmaline crystallizes in the hexagonal system. It has a hardness of 7–7.5, has very poor cleavage, conchoidal fracture, is strongly piezoelectric, and has good toughness. 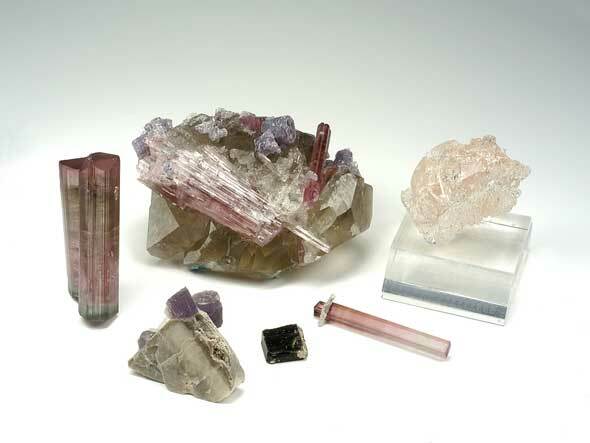 Of the numerous species that make up the tourmaline group it is mostly the elbaite or liddicoatite species that interest gem and mineral collectors. These two species come in gemmy crystals in nearly all colors, hues, and saturation. One famous Brazilian dealer has a collection of over 700 colors. The causes of these colors are complex due to color centers, traces of metals, and ion charge changes. 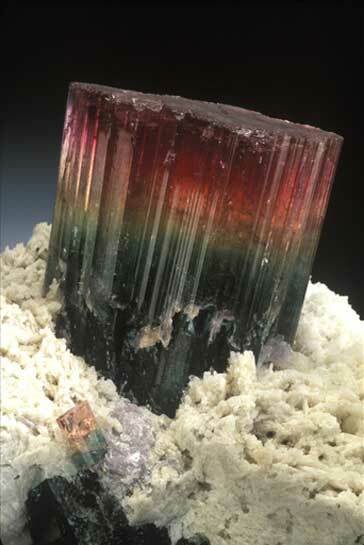 Tourmaline has wide distribution and is found in most parts of the world. Major deposits of tourmaline are found in Brazil, United States (especially Maine and California), Afghanistan, Russia, China, Burma, Vietnam, and throughout much of Africa, especially Namibia, Zambia, Tanzania, Mozambique, and Madagascar. A worldwide excitement has transformed tourmaline gem appreciation in the past 15 years with the discovery of a copper bearing “neon blue” tourmaline, first found in Paraíba state, Brazil. This material has such a distinct color range it is now known in the gemstone trade as a variety: paraiba. Further discoveries of this beautiful gem are now found in Rio Grande do Norte, Brazil, also in Nigeria, and more recently in Mozambique. All are copper bearing and have ranges of the “neon” blue and green colors. Gems of the finer colors have been regularly sold in the market for US$5,000 to 20,000 per carat. Some dealers have even been asking more, making paraiba the most desirable of cut tourmaline gemstones. All other colors of tourmaline are also exciting and much more affordable. The tourmaline gem varieties are called many terms: achroite (colorless), rubellite (red) ; bi-colored (tourmalines can exhibit two or more colors in one gem). These terms are numerous and a little confusing, so often using the color as description is preferable, e.g., for indicolite, simply use blue tourmaline. Looking in the pricing guides, most of these faceted tourmalines are valued, if clean and fine, from US$100 to 1,000 per carat. Cabochon and carved tourmalines are even more affordable and still beautiful for jewelry designers worldwide. Himalaya, Southern California style. The Himalaya Mine, actively mined by Pala International from 1977 to 1998, sits in the rolling hills of San Diego County. The mine is barely visible in the center of this photograph, just below the top of the ridge. Pala International’s connection to tourmaline starts in 1968 with the purchase of the famous Stewart Lithia Mine in Pala, California. This mine was famous for producing tourmaline in the 1890s and had been dormant for decades. In 1969 Pala International miners rediscovered the “lost” tourmaline adit and started producing pink tourmalines once again. 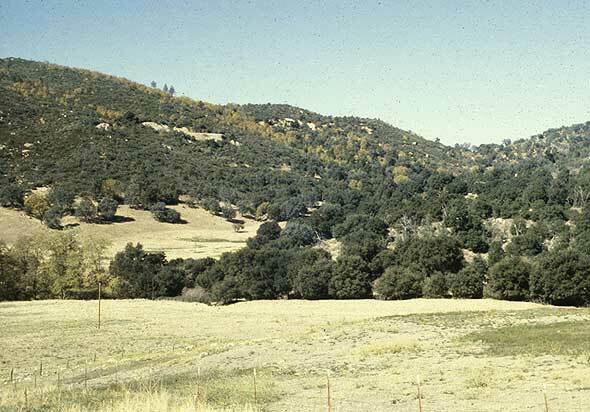 In 1971, Pala International leased the Tourmaline Queen, and Pala Chief Mines in Pala, California. 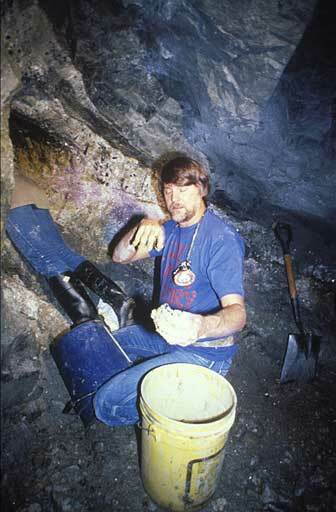 In 1972, while mining in the Tourmaline Queen Mine, we hit the famous Blue-Cap pocket described by the curator of the American Museum of Natural History, Dr. Vincent Manson as the “find of the century.” In 1977, Pala International leased the Himalaya Mine and started exploratory workings. In 1981, after driving a 700-foot-long tunnel, the original pegmatite dike containing gemmy tourmaline pockets was encountered at depth, and good tourmaline production was once again available in San Diego County. Various buyers and scholars came from all over the world to visit the Himalaya Mine, including several curators of the Beijing Natural History Museum, guests of Dr. Peter Keller. You are getting sleepy... In the depths of the Himalaya mine, Bill Larson attempts to hypnotize an unsuspecting specimen. Another victim, Pala’s John McLean, lies behind him to the left. The China connection: Chinese gemstone carving and the Empress Dowager’s passion for colored stones. The Empress Dowager, who ruled China from 1860 until 1908, became known as Tz’u-hsi. Her preferences in gems influenced the imperial court and the lives of prominent Chinese. While her favorite color was blue, she had a passion for red and even pink red. Her favorite gem was jade but, she was also fascinated by many other colored gems. By the late 18th century the Chinese were the leading gemstone carvers in the world. Chinese buyers searched worldwide for supplies of colorful gem rough from 1890 until 1908. 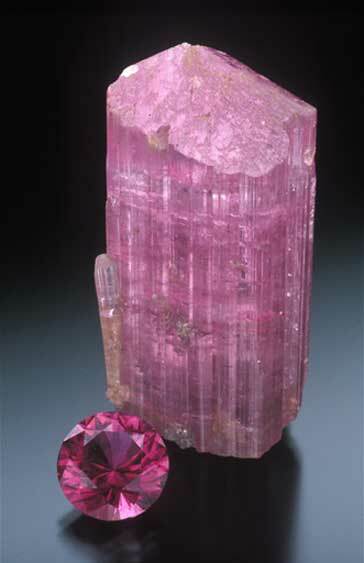 It was during this period that California pink tourmaline became available. Dr. Richard Jahns and other have estimated the production of San Diego tourmaline until 1910 to be approximately 90 tons! Of this total the majority was sold to China. Most local dealers remembered fondly the Chinese buyers as being fair and honest. 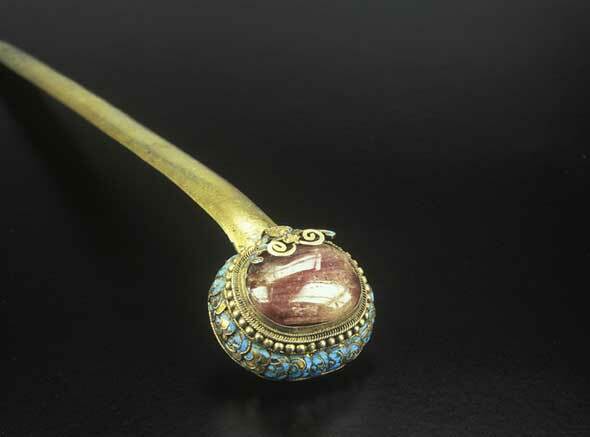 Early 20th century Chinese hair pin with pink tourmaline in the center and accented with feather. The preferred tourmaline material was what is described as cabochon quality, free of large cracks and slightly included, perfect for carving. All colors of pink were purchased but the finer pink-reds brought up to US$20.00 per pound! Locals remember that to keep the rough price consistent green caps were often broken off and thrown away in the dumps to be found decades later by excited rockhounds. Orders for rough tourmaline were delivered to the Himalaya Mine for “so many barrels” of tourmaline! These orders were made through the Himalaya Mining Company of New York to the mine manager, Lippman Tannenbaum and local Mesa Grande cowboys were then hired to dig out the tourmalines until the order was filled and shipped. Payment was handled through the import-export bank of New York. With the demise of the Empress Dowager in 1908 the Chinese gem market fell off and most of the San Diego tourmaline mines closed shortly thereafter. Some California Chinese continued to be involved with tourmaline, including “Tom” Quin a gem buyer, who leased the Himalaya Mine in 1916 and purchased the property in 1926. He was known to give away tourmaline crystals as favors at lotteries up and down the California coast. The mine was in his family until 1950 when he sold it to Ralph Potter. Early 20th century tourmaline snuff bottle, from the Tourmaline Queen Mine, Pala, CA. 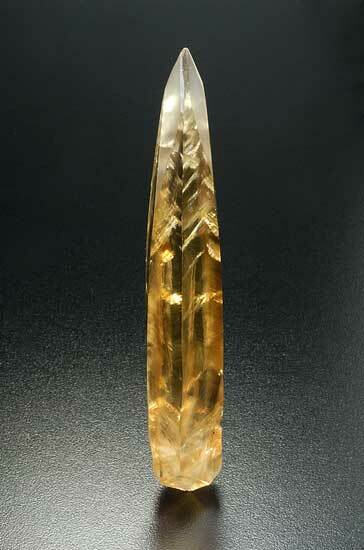 Chinese tourmaline carvings are scattered throughout the world, in private collections and in many major museums. There is a fabulous pink tourmaline pendant carving on display in the British Museum from the early 1900s, exquisitely carved. The Empress Dowager’s extensive personal gemstone and jewelry collection was reputed to be kept in 3,000 boxes, according to various references. She even had a secret storage room constructed behind the headboard of her bed. 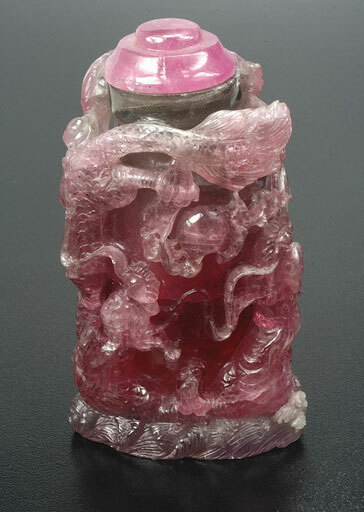 A part of this collection is on display in the gem rooms of the “Forbidden City.” Pink tourmaline is prominently exhibited as jewel encrusted borders on various paintings. There are individual carved items, including a superb deep pink-red pendant on a silk necklace with imperial jade. Upon her death in 1908, Tz’u-hsi was literally enshrined in gemstones, including 108 gold, jade, and colored gemstone Buddhas placed on her body. At each of her feet were placed 200 bright colored-gemstones carved into peaches, pears, apricots, and dates. The future looks bright for new tourmaline artists and carvings not only created by Chinese artisans but collected and appreciated by Chinese connoisseurs and Chinese museums throughout the People’s Republic of China. Two pages from the conference program demonstrate the breadth of topics covered. of China and America in the 21st century. Today, through the study of science, we have a greater understanding of minerals and gemstones, which allows us to appreciate their rarity and uniqueness. Mineral collecting has existed for as long as minerals have been mined. For hundreds or perhaps thousands of years, people digging ore found fascinating crystallized objects that defied explanation. These crystals showed orderly forms in a chaotic universe. 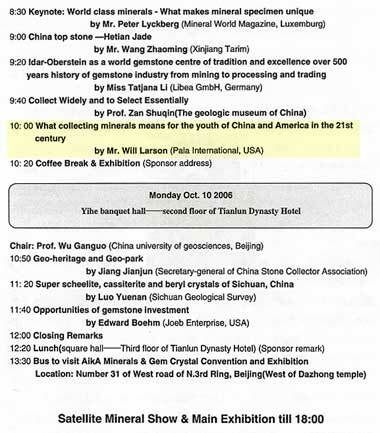 Will Larson discusses aspects of mineral collecting for the youth of China and America on Day 2 of the conference. In recent years collecting has evolved significantly. With our greater understanding and appreciation of minerals we, as the 21st century youth, will continue to enjoy the wonders of the mineral world. I have collected minerals all my life and as a young collector I still have much to learn, but I would like to share with you some of my thoughts on collecting: Why collect, what to collect, and how to collect. First of all why would one bother collecting, what purpose does it serve? And what does it mean to be a young collector? For those of us who already collect we have answered this question for ourselves, but I’d like to go through some of my own reasons as to why I collect. As we all know, collecting is not easy; it can be time consuming and difficult, but I believe that is all part of the fun of collecting. Most of the best things in life are not easily obtained, and this would also apply to the hobby or business of minerals. Collecting minerals can bring you many joyful and fun experiences if you can visit mines or local areas where crystals are found, as well as visiting local gem or mineral shows that exist in many countries around the world. Specimens collected over the years from the Himalaya Mine (above), which Pala International mined between 1977 and 1998. 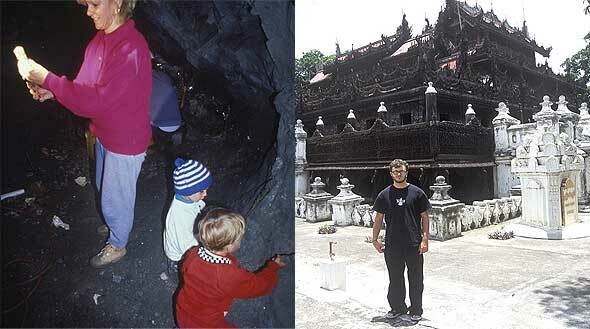 Will Larson’s collecting has taken him from the mines of Southern California (below left) to Burma (below right). 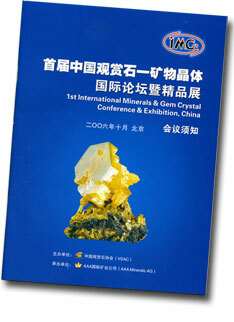 Now China has an annual mineral and gem show with this first Beijing conference. 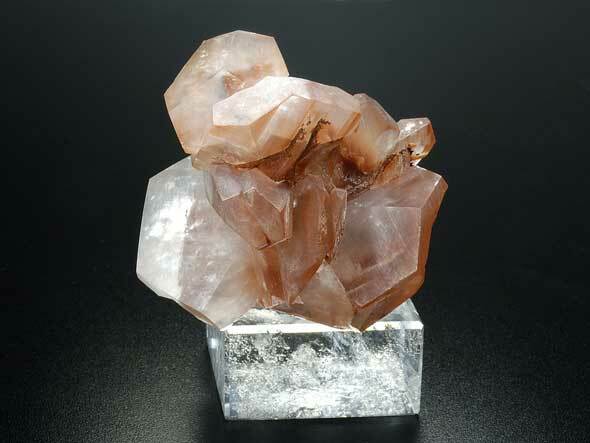 Anyone can also visit websites for minerals in order to obtain knowledge or to add to your collection. There are websites one can exchange minerals you have found for some other person’s self-collected pieces. Or one can start to purchase the better quality minerals. Not only is this kind of collecting fun, but it can be a great investment as well. Collecting does require a great amount of knowledge and study. As for my own reasons why I collect, it comes from my mind and heart. Minerals have always stimulated my imagination—why are they here, what caused them to form this way, and how could there be such beautiful non-living things? For those reasons I studied minerals and began collecting beautiful minerals. As a young collector you have less knowledge and experience than others; as such it is hard to establish yourself in the mineral world. So as a young collector you must focus on gaining knowledge and experience. 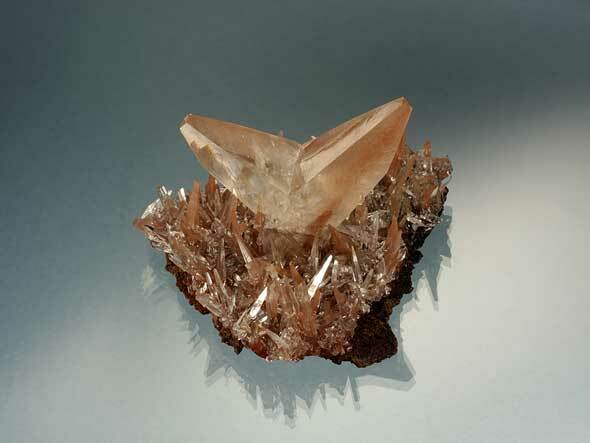 The more active you are and the more you see, the better chance you will have in finding the best mineral specimens. What minerals should one collect? Personally I think every mineral can be collected! There are no bad minerals out there but some bring more attention than others. What to collect, I believe, is a personal choice; it can be influenced by your home country or state or a place you visited on a trip, it can be a classification or type of mineral such as tourmaline, rare minerals, sulfides, corundum—the list goes on and is almost endless. What’s important is to find out what you like and collect it! Presently China is one of the predominant producers of new material in the mineral market, since there are many mines actively producing ore minerals. 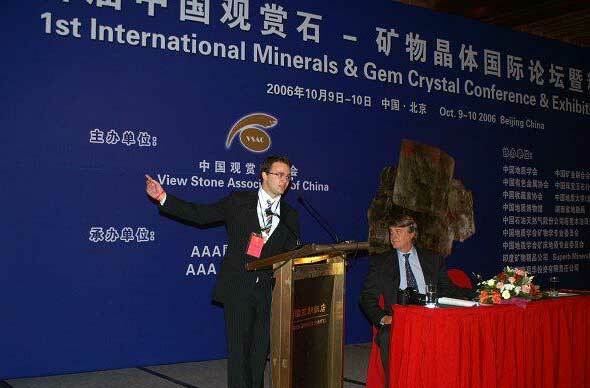 For the past few years a new find of Chinese minerals has brought stimulation to the markets in Europe and America. 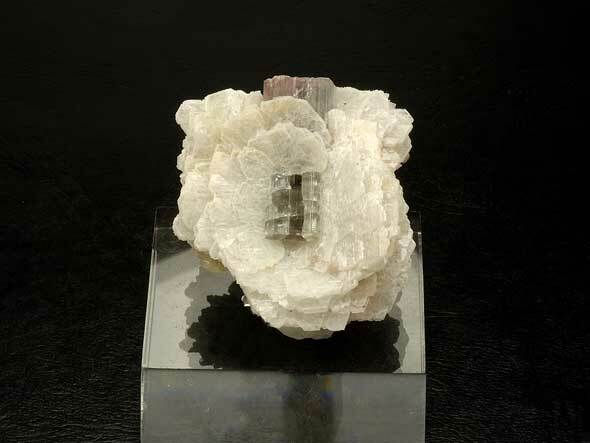 Many collectors are now specializing in Chinese minerals. Just within the past few months there has been a new find of Chinese rhodochrosite crystals. These new crystals caused excitement at the June mineral show in Sainte-Marie-aux-Mines, France. In the last few years I myself began collecting Chinese calcites because I found them so unusual and interesting. So for those of us who are young, why not collect what is new and exciting? In a few years what is common today is often worked out, and thus rare and more desirable. So how can one collect and build up a collection? Well, thanks to the Internet you don’t need to leave your home anymore, but that does take some of the fun out of it. Visiting mineral shows is still considered the customary way of finding what’s on the market and is a great way to build knowledge as to what is out there. At mineral shows not only do you see the minerals face to face, but also, some you may be able to hold in your hand before making a purchase. The most traditional way of collecting is to self-collect—for those of us young and strong enough out there to dig. I have visited many mines in my lifetime and from them brought back at least a piece of rock. As young kids and adults we can amass these small pieces and either trade or sell them to upgrade our collections. Trading what you have found for what someone else has either found or purchased is quite rewarding. There is something about self-collecting that can awaken you to the reality of how rare and hard minerals really are to find. Self-collecting can bring out appreciation for every mineral ever found!